L.t.r. : Daniela Truffer (Zwischengeschlecht.org / StopIGM.org), Morgan Carpenter (OII Australia), Julius Kaggwa (SIPD Uganda), Mauro Cabral (Justicia Intersex Argentinia), UN High Commissioner for Human Rights Zeid Ra’ad Al Hussein, Hiker Chiu (OII Taiwan), Kimberly Zieselman (AIC USA), Dan Ghattas (OII Germany). Photo: UN OHCHR. 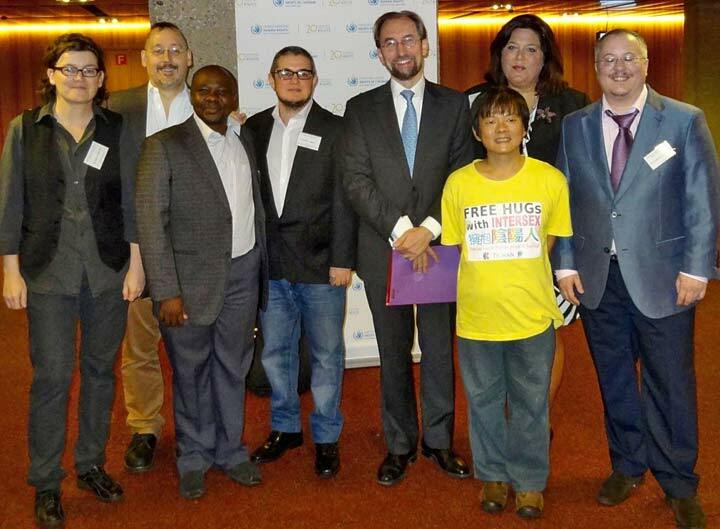 The Office of the UN High Commissioner for Human Rights (OHCHR) published a >>> news report on the UN Expert Meeting on ending human rights violations against intersex persons last week in Geneva. The report includes quotes Daniela “Nella” Truffer, and explicitly mentions the demand for “a legal ban on medically unnecessary surgeries and treatment on intersex children without consent” as well as UN bodies recognising IGM as “harmful practice” und “ill-treatment”. This blog says thank you! 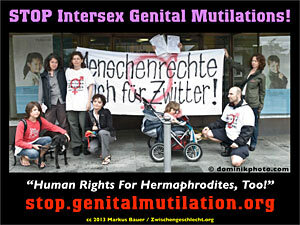 – UN Intersex Expert Meeting: IGM– Ending the Impunity of the Perpetrators! What everyone should know about Intersex Genital Mutilations (IGM)! IGM: Ending the Impunity of the Perpetrators!